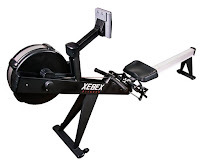 The Xebex Air Rower AR-1 is a well-constructed rowing machine, comparable in quality and features to the Concept2. The Xebex Air Rower features a Damper resistance system with a large range of resistance from 1 to 10 settings – level 1 simulates rowing near the surface of the water with less resistance, while level 10 simulates deeper rowing with heavier resistance for a more demanding workout. 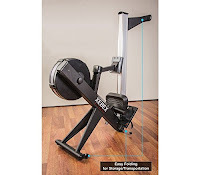 The Xebex Air Rower is ergonomically designed with a slightly angled padded handle for a more natural comfortable grip, and an extra-padded contoured seat that glides smoothly along the 55” angled monorail. The seat itself is 21” off the ground allowing for swift and easy entry and exit. 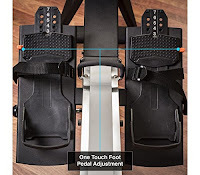 The 1-touch footing adjustment on this rowing machine allows for quick and easy adjustments for an efficient and comfortable workout. There’s no need for aggressive start-up tugs or exaggerated pulls with this rowing machine. The Xebex Air Rower is designed to pull more smoothly with every pull as you build-up momentum. 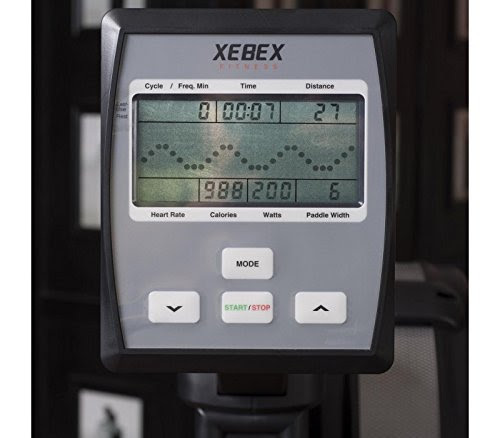 The Xebex Air Rower comes with an easy-to-use console that displays motivating workout stats as you row, including pace, distance, speed, calories, paddle width, watts, and heart rate (compatible with any 5k frequency heart-rate chest-belt or watch). The console offers pre-programmed interval settings and even a “Just Row” option. You can also set target goals such as distance target, calories or time with a 500m pace option. Unlike other consoles, Xebex Rower’s console waits for you to begin rowing before it starts to track time etc. Simply press Start on the console to activate it and you will begin to see your stats as soon as you start rowing. 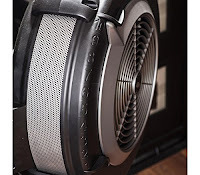 The Xebex Air Rower can be folded to save space for storage – simply pull the pop-pin that’s attached to the bottom of the base rail, the base rail will collapse and the Rower can then be folded vertically, cutting its length in half. This rowing machine also comes with 4 transportation wheels for easy portability. The Xebex Air Rower AR-1 comes with a manufacturer’s warranty of 5 years on frame and 2 years on parts. 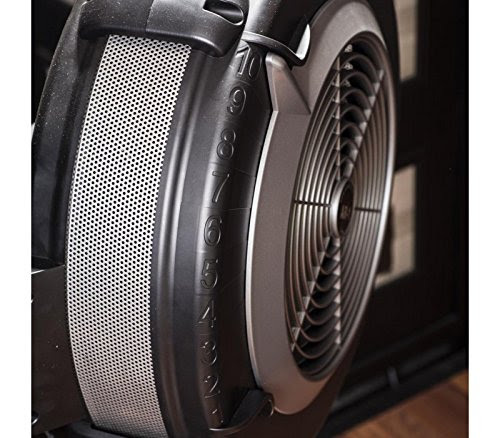 To give you an idea of this rowing machine’s durability, the Xebex Air Rowers have been tested with 1,000,000 pulls from extra-strength Robotic Arms without failure. The Xebex Air Rower’s heavy-duty frame weighs around 95 lbs and will accommodate a maximum user weight capacity of up to 500 lbs. Fitness tip: Just 30 minutes exercise on a rowing machine could burn between 262-449 calories for women or 310-531 calories for men, depending on the intensity of the rowing. Rowing machines offer an all-round fitness workout, utilizing all the major muscles groups of the body, toning and strengthening as well as helping to improve cardio and burn calories. Rowing is a low-impact exercise which means that it’s easier on your knees and joints compared to many other forms of exercise while still giving a very effective workout. N.B. It's always advisable to consult your doctor or health care professional if you are new to exercise or have any concerns relating to your health and fitness regime. Always follow the manufacturer’s instructions for safe use of exercise machines/equipment.